thanks for the answers, those findings are amazing, i look forward to see explanation for those examples. With these stuff we actually prove scientifically divnity of Quran. 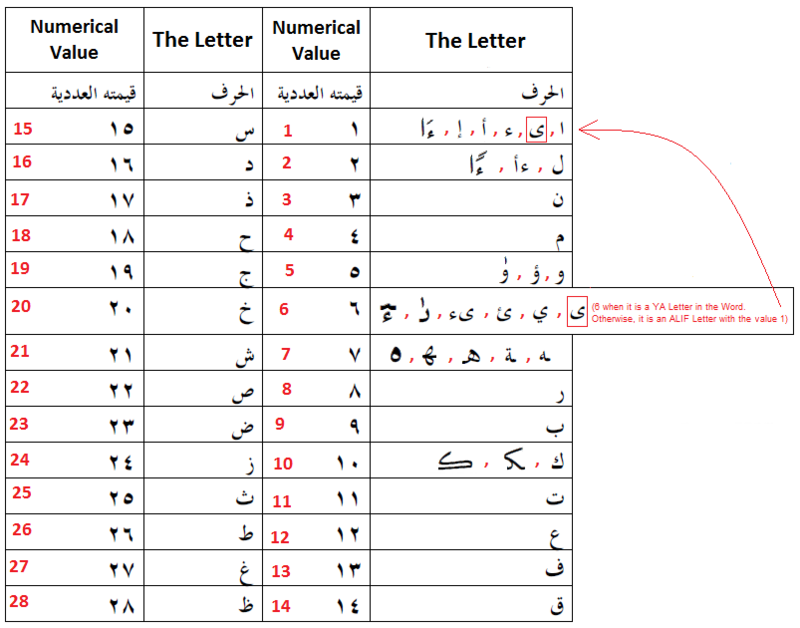 When was quran written with standard arabic? [020:114] High above all is God, the King, the Truth! Be not in haste with the Quran before its revelation to thee is completed, but say, "O my Lord! advance me in knowledge." [075:016] Move not thy tongue (i.e., do not O Muhammad recite It before you master Its recitation that is taught to you by Gabriel) concerning the (Quran) to make haste therewith. [085:022] (Inscribed) in a Tablet Preserved! i think that nummerical miracles in the quran are more powerful than scientific verses in the quran since verses are interpretated while nummerical miracles is empirical counting, that is not interpretation but actul facts wich everybody can count and test and verify. i will definitly used those examples in dawah inshallah. And Angel Gabriel wrote the Holy Quran with Prophet Muhammad. maybe angel gabriel but not Muhammed, muhammed was illitarate he could not write his own name. I don't believe that Prophet Muhammad was illiterate either. This again goes back to our history having false information and conspiracies. I believe the Prophet was literate, at least after the Holy Quran began to be revealed to him. Ummi does also mean BEING COMPREHENSIVE or GRAND, and not just illiterate. The Holy Quran was called UMM AL KITAB (the GRAND BOOK; the ULTIMATE BOOK). Ummi is derived from Umm. And Umm also means mother. I don't believe the Prophet didn't know how to read and write when the Holy Quran began to be revealed to him. I believe he knew well how to read and write, or at least he was taught so by Angel Gabriel when he started receiving the Holy Quran's Revelations, and learning how to document Its very Complex Text. It takes far more than an illiterate person to truly Master the Holy Quran in Text and Recitation, and to perfectly preserve It. brother when can we expect first explanations in english about those pohots you posted in zip. Luckily walhamdulillah (all thanks to Allah Almighty), I just finished my work project (I am a senior IT consultant). This was a 9-month project. Hopefully, it'll be another few weeks till I get assigned to a new project. I am sitting at home. And I am focusing all of my energy and mind into finishing the rest of the 1/2 or 2/3 of the images. Once I get all of them finished and scanned, then I'll start on the English article (it'll be as big as a book), Insha'Allah. All I can say is that I am currently working hard on it . May Allah Almighty give me the power to finish it in a timely manner. dont forget you can earn Allah's mercy and paradise only by doing this , beacuse i will definitly use that material in my dawah, and dont forget that good deeds copies from other to you. so whoever post one of your translated numerical miracles and present them to others that person will get good deed and that good deed will copy to you automatically on your account without reducing anything from that person. so imagine someone use your material and give dawah with it, good deeds copy to you while you maybe sleep and dream, good deeds copies to you from other people. same it is with evil deeds. Thank you, dear brother Dawud. May Allah Almighty bless you and your family, akhi. I will Insha'Allah keep everyone posted on the progress. I have just updated the Main Table at: http://www.answering-christianity.com/main_table.png. Man, the more I learn about the Holy Quran's Text, the more and more stunning It becomes to me! Look at the LONG ALIFS in the table, and the delicate positionings of the HAMZAs, and how the Hamza's value would change depending on Its position. A new batch of scanned images is coming up, Insha'Allah. I did emphasize in red those different positions in the Noble Verses that they occur in in the new upcoming batch, and in also the previous one. i hope we will get good explanations for those photos from you in coming weeks.